Granite is a natural stone, which comes in a massive range of colours. It is a completely natural process how the colours of granite form – many factors are at play here. 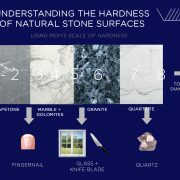 We found this article explaining how we come to find so many beautiful natural colours in the granites we see today! Granite colours range the spectrum from white to black to pink, but what makes a single rock type so variable? Here we will discover what makes each granite a different colour, what that tells us about its mineralogy and origin. You may be an amateur geologist, just curious, or looking for your new granite countertops. 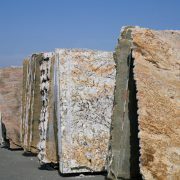 Regardless of the reason, you’ll be amazed at the vast varieties of different granites. Granite is an intrusive igneous rock with large grains (minerals) easily seen by the naked eye. Granite colours are most commonly pink, white, variations of grey and black. 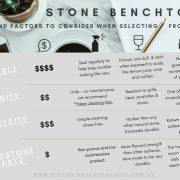 However, it’s important to note that some stones marketed as black ‘granite’ are in fact likely gabbro as granite must contain at least 20% quartz within a rock to make it granite. Granite is a conglomerate of minerals and rocks, primarily quartz, potassium feldspar, mica, amphiboles, and trace other minerals. Granite typically contains 20-60% quartz, 10-65% feldspar, and 5-15% micas (biotite or muscovite). The minerals that make up granite give it the unique colours we see in different types of granite. The relative proportion of different coloured minerals in a granite is largely due to the original source of molten rock that cooled to form the granite. If the molten rock was abundant in potassium feldspar, the granite is more likely to take on a salmon pink colour. 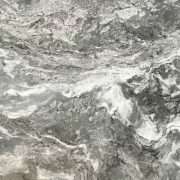 On the other hand, if the molten rock is abundant in quartz and minerals that make up amphibole, you will likely get a black and white speckled granite commonly seen on countertops. “Black granite” is commonly seen in commercial rock, but it is not granite at all. As said above, granite must be at least 20% quartz, which means an all black rock is not a granite. Most commonly, black granite is in fact gabbro, a mafic intrusive igneous rock similar to basalt. Gabbro is primarily composed of minerals pyroxene, plagioclase, and small amounts of olivine (dark green) and amphibole. Pink coloured granite is a result of an abundance of potassium feldspar within the granite. You can see small specs of milky semi-transparent quartz, dark brown/black amphibole, and opaque white feldspar. However, in a granite like the one above the primary mineral is potassium feldspar. Red granite is a variation of pink potassium feldspar abundant granite, where the k-feldspar takes on a redder than pinker colour. Also, you can get red colouring from iron oxide in hematite grains or inclusion within feldspar, essentially the same process that makes rusted metal ruby red coloured. You may find advertisements for blue granite countertops but this is also almost certainly not granite. One potential is that the rock is actually Larvikite, an igneous variety of monzonite and sometimes referred to as “blue granite” despite it not being granite. Another common alternative is Anorthosite, a rock that contains abundant blue labradorite and is sometimes sold as blue granite. When advertised as green granite, often times the stone is actually a green variety of marble, which gains its green coloration due to inclusions of serpentine. It could also be a green variation of soapstone, mislabeled as granite. Granites are not abundant in green coloured minerals, but there are a variety of different rock types that do contain green minerals in abundance. One very unusual way to get a green coloration is the inclusion of amazonite, a green variety of feldspar. Granite Benchtops - Hard To Beat!